TADHack Global will run over the 14-16th October (Friday-Sunday), locations will run on 2 of the 3 days. We have 32+ locations confirmed around the world including: Athens, Austin, Bangladesh – Dhaka, Berlin, Boston, Brisbane, Buenos Aires, Chicago, Kuala Lumpur, Kyiv (Ukraine), Lisbon, London, Madrid, Melbourne, Mexico, Moscow, Netherlands, NYC, Orlando, Oslo, Pakistan, Paris, San Francisco, Seattle, Singapore, South Africa, Sri Lanka – Colombo, Sri Lanka – Jaffna, Stockholm, Sydney, Tokyo, Voronezh (Russia), Warsaw, and Zambia. Plus the comfort of your own home, that is remote entries. We also have more locations in the pipeline. Its great to see the whole industry working together to build a global community around telecom app development. Thanks to the global sponsors for making TADHack Global possible: Canonical / Ubuntu, Cisco Spark, hSenid Mobile, Matrix, Telestax, Tropo, and VoxImplant. Partners for running locations including: Clarify, CMTelecom, DataArt, UPM, Flowroute, IST, IPCortex, Iquall Networks, Locatrix, Magyar Telecom, MTN, BongoHive, ProIDS, Synchronoss, Telenor Digital, Telstra, Temasys, TXM, UCL, VoIP Labs, WebRTCH4cks, IIT RTC Labs. Application to person (A2P) on messaging platforms: Hacks on platforms such as Slack, or Matrix, or Facebook Messenger, or any other IP messaging platform. BOTs are software programs on communication platforms: BOTs have been theme of TADHack since its inception, as well as becoming quite fashionable. Hacks like Guber Conference from TADHack Chicago have become commercial services. Internet of Things: From dancing robots to an irrigation hack from Sri Lanka that has gone commercial. IoT remains a theme at TADHack, with a focus on getting those ideas to market. Network Function Virtualization and The Dangerous Demo. In 2014 we showed the hack, IMS in minutes, this became the dangerous demo we showcase at every TADSummit. In 2015 we showed a complete mobile core network running in the cloud. We’re keen to see hacks around NFV or built on the Dangerous Demo. We’ll have more details coming soon. Artificial Intelligence. AI has become a part of many hacks created at TADHack in 2015 and 2016. TADHack is where bleeding-edge technologies become real practical solutions to everyday problems. More dev themes will be announced, and we’ll be adding more details. Go to TADHack Global and register either for a city near you or remotely. Its going to be an amazing global event, where developers, creativity and technologies are celebrated in their ability to make the world we live in better. We have lots being planned for TADHack Global, including exciting keynotes, a few special visitors for some of the locations. And remember, all hacks are recorded and published on the TADHack YouTube channel so your effort is rewarded with collateral you can use on your resume, at work, or simply to wow your friends. TADHack is for Everyone! How can I know where the event will be hosted in my country? Or is it all remote? 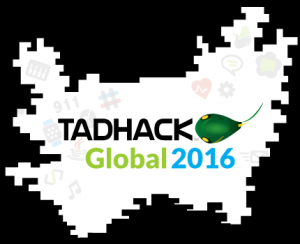 Check out the list for TADHack GLobal here: http://tadhack.com/2016/global/. If there is not one close by to you, then enter remotely. Thanks for your question.